As a breastfeeding mom, I always think if my milk supply is enough to feed Jabe. Lately, I noticed a decrease on my milk supply, Jabe has always been hungry and I can not save any extra breastmilk unlike the past few weeks wherein I can store at least 4oz per day of breastmilk in the freezer. So I did a research on what I can do to increase my supply and have it back to normal as I don't have intentions yet on weaning Jabe and stopping breastfeeding. I came across Mommy Treats Facebook Page. Finally! Goodies made specially for us mommies! Mommy Treats is a small business project started by a first time mommy who was once in dire need of increasing her milk supply. LACTATION COOKIES and LACTATION MUFFIN BITES! Curiousity got me and I browsed her FB page to see her menu, testimonials from clients, and many more. I placed an order of 1 week supply of Chocolate Chip Cupcake Bites, which is a lactation cupcake that is packed withnatural galactagogues such as fenugreek and brewer's yeast. 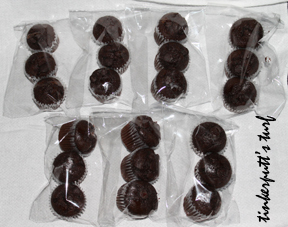 One week supply will contain 7 packs with 3 pieces of Cupcake Bites per pack. When I got the email confirmation, I was only able to pay after 4 days. I am also thankful that she accepts Paypal payments so I need not ask my husband to deposit the payment on my behalf. After paying, I received an email that my order will be baked on that day. After lunch, Mommy Paola told me that my Cupcake Bites are cooling off and ready for pick-up around 530pm at Ortigas. I immediately asked my husband if he can or he can ask someone to pick-up my orders since his office is just infront of the Renaissance tower where the pick-up area is. I was so excited to get my order and eat it as I am really in need to increase my milk supply. 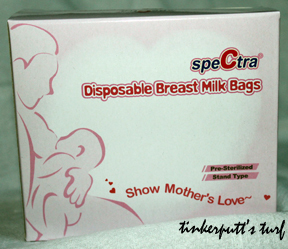 And I even got a Freebie of One box of Spectra Disposable Milk Bag! It was a hassle-free transaction with Mommy Treats. I am now totally excited to try my Chocolate Cupcake Bites! At the same time, excited to increase my milk supply for Jabe! I'll post my feedback soon about it.